This produces an extremely light fluffy sponge cake with a lot of flavour. Sift the flour into the bowl and using a spatula/metal spoon (or equivalent) fold the flour carefully into the mixture until the flour is incorporated (mix any varation ingredients in with the flour). Split the mixture evenly between the two tins and spread the mixture evenly within the tin using a small palette knife. Bake at 325°F (160°C) for 30 to 35 minutes. The cake should be golden brown and feel firm and springy when cooked. Topping - Take approxmately 100g of cooking milk chocolate and carefully melt together with 1/3 (33g) butte. 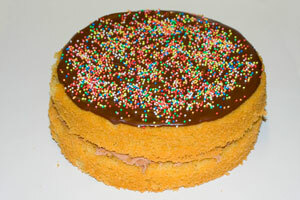 Butter cream filling - Blend 75g (3oz) butter, 175g (6oz) icing sugar, 15ml (1 tbsp) Cocoa powder, 15-30ml (1-2 tbsp) milk. Topping - Lightly dust with icing sugar or use chocolate topping amounts from above with white chocolate. Butter cream filling - Blend the same ingredients replacing the cocoa powder with a few drops of vanilla essence.